Rods and Coils is an improvised installation that treats building as a form of drawing, emerging as an erratic extension of both the space and the electricity from a singular wall outlet. 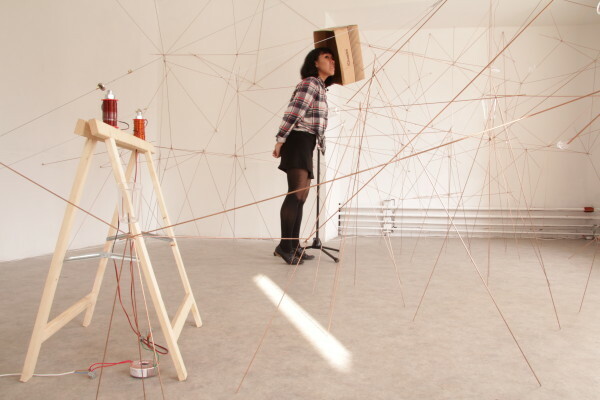 Produced during a 2.5-week residency, the project is a result of a series of experiments with hand-wound electromagnets, simple alternating current circuits, and ad hoc architecture. The resulting installation is a large network of metal rods interconnected by strong rare earth magnets. Metal elements found in the gallery, such as water pipes, light fixtures, nails hidden under layers of paint, and window frames, are used as anchor points for the structure, and in one case as an armature for one of the several copper wire coils. These coils draw electricity from a single wall outlet, harnessing the alternating current in order to oscillate the assembly. The Rods and Coils installation playfully imagines the idea of electromagnetic activity as physical lines in space, embodied in a temporary structure that can be entered and experienced. Two of the most important guidelines for the work of Flemming and Swintak seem to be intuition and site specificity. Coming from the original project plan entitled Public Metal, their work was tranformed into, under site specific circumstances, an interior Road and Coils installation. What is left from the inital idea of Public Metal here, is, as Peter Flemming said during the installation opening, only the metal part. The main idea of the initial project was to change the existing metal objects in public spaces (such as sculptures, lampposts, etc.) by giving them a new purpose; for example, turning them into unusual antennas or low-fi radio transceivers. Guided by the idea of metal only, they decided to, instead, transform the interior space of the Mediatheque. Using the metal elements found in the gallery, such as water pipes, light fixtures, nails hidden under layers of paint, and window frames, as anchor points, they created a structure made entirely of rods and coils. They interconnected them by strong rare earth magnets and, using the method of trial and error, created a seemingly fragile and reticular entity. The installation is possible to be entered, and thus be seen from a closer perspective. Another part of the installation consists of vibration and sound. The entire structure is under electromagnetic activity. By turning the installation on, we can hear the sounds coming from different object artists have found at the gallery. The objects like boxes or plactic glasses are attacthed to the rods and produce different sounds, depending on the movement of the visitor. The coils, on the other hand, draw electricity from a single wall outlet, harnessing the alternating current in order to oscilitate the assembly. The whole structure vibrates and makes the electromagnetic activity visible in clear, physical lines. The structure of rods and coils invokes the use of audiovisual senses and makes us enjoy the possibilities this specific space can offer.